If you’ve ever crushed on a celebrity, it’s highly likely that you’ve fantasized about fate making it possible for the two of you to meet and fall in love. In fact, in my case, I went further than just fantasizing about it – I made it happen in fan fiction many times and in many different scenarios. This is What Happy Looks Like is similar to the fan fiction I wrote so many years ago, as a small-town girl meets a famous celebrity by a random twist of fate (in their case, an email gone astray). But there’s much more to this novel than meets the eye, as it’s not just about the romance. It’s also about Ellie, a small-town girl with big dreams and a secret that she and her mother have been keeping for years. It’s also about Graham, a teen celebrity who’s longing for something real, which would be a change from the shallow, image-centered world of celebrity. It’s also about a pig named Wilbur, a boat called Go Fish, a beach strewn with rocks, whoopee pies and ice cream. 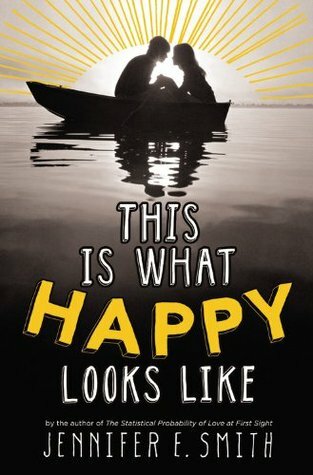 Smith has, once again, managed to use her talent for words to concoct another quietly beautiful tale in This is What Happy Looks Like. The romance is central to the novel, of course. It begins with a seemingly innocent and really cute string of emails about the most random of topics, but each one extremely heartfelt and sincere. Graham is compelled to find a way to meet Ellie, and finds a way to ensure that his latest film will be shot in her hometown. Their first meeting might have been awkward, but slowly and surely, Graham and Ellie discover that they are developing feelings for each other. Most of their private, romantic moments were a teensy bit cheesy, but I have a fondness for cheesy, so that worked out well. Smith’s strength this time around, in my opinion, lies in her ability to get the reader to care about both Graham and Ellie as individuals, and not just as a couple. She is able to realistically tell Graham’s story, one of loneliness and confusion in the whirlwind pursuit of an acting career. All the while, she also reveals Ellie’s story, one of the secret she’s kept all her life and her dream of attending a poetry workshop at the end of summer. Each of them has their own wants, dreams, fears and desires – and Smith was truly able to get me to care about each of them. As always, the writing was wonderful. Smith has a gift in the way she uses details to coax her settings and her characters into life. She transported me to the little town of Henley instantly with her careful descriptions of the places that Ellie and Graham encountered each day. She also used details to craft memorable characters with their individual quirks to set them apart. I always enjoy Smith’s turns of phrase and carefully chosen words, and this book reinforced that love. This is What Happy Looks Like is a love story between a teen celebrity and a regular girl. But it’s also Graham’s story and Ellie’s story, as each of them deals with what life has brought their way. Paired with Smith’s incredible writing ability, this enticing combination sucked me in completely. Upon finishing the book, I had a smile on my face – and an intense longing for summer and ice cream – that could only have been brought about by a feel-good story like this one. Awww, it sounds so cute!! Books that leave you with a smile on your face are the best ones :) And I like that you mention it's more than just a romance (though I love me some romance). I'm anxiously awaiting the release of the paperback! I loved The Statistical Probability of Love at First Sight, am I'm so excited to read this book! I'm glad you liked it, that makes me even more excited for it. I really loved this one! I totally expected to, since I've heard awesome things about Jennifer E. Smith. :) I loved the actor/regular person part of it ... and the love. And the kissing. I loved it all! This was a sweet story of young love. I enjoyed reading how this unfolded and how this family moved on in spite of potential emotional damage to them and or the removed father.